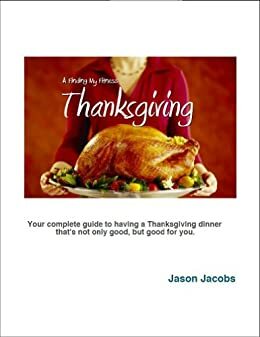 Slow Carb Thanksgiving Recipes - A Finding My Fitness Holiday - Kindle edition by Jason Jacobs. Cookbooks, Food & Wine Kindle eBooks @ Amazon.com. Have you read The 4-Hour Body and decided to start following the plan in it? Do you want to follow as close to a slow-carb diet as you can this holiday season? You can crush it during the holidays with these great recipes! - 7 pages on preparing the perfect poultry! All of the recipes are completely Paleo compliant, and many of them are totally Slow-Carb friendly (for my fellow 4-Hour Body followers)! You know how it is. The turkey, stuffing, mashed potatoes, dessert - they all helped put you in a coma that kept you hibernating until the following Monday. They say it's the triptophan in the turkey, but I wonder if it was actually a hyperglycemic coma that would slowly work its way into type 2 diabetes if we let it. But it doesn't have to be that way. In this guide, you'll find out how to make the perfect turkey, get recipes for a whole host of side dishes, and even get recipes for desserts. I got this guide the other day, and just finally got around to reading it. It is perfect for those of us trying to stay healthy and maybe even lose some pounds during the holidays! I enjoy cooking - especially holiday meals, but one of the frustrating things is putting together an entire plan for the meal - this had great tips and recipes to put together a complete thanksgiving meal that would probably feed about 10-12 people. The really big upside? If you're eating paleo and your guests aren't, I honestly don't think they'd notice the difference in the meals! If you need ideas for the holidays and want to eat clean and healthy, this guide is perfect for that! I've been on the slow carb diet for over a year now and dropped several stone. The one black spot was the holiday season. I went off the diet for a week and put on half a stone. This year that is not going to happen and that is soley down to this eBook. Jason has provided a complete list of recipes that are low carb/paleo compliant. Everything is explained well with clear instructions that even an idiot like me can understand. It's all there, turkey, trimmings, even desserts, cranberry sauce and mulled wine are covered. I'm therefore going to make it though the holidays this year without having to break my diet. Thank you so much Jason! This book presents a fully-formed menu plan (with recipes) and lots of extra tips and training. I am a big fan of Jason Jacobs' recipes, because they have always provided clear instructions and deliciously healthy results. Additionally, the extras (for example, how to carve the turkey) built my confidence and resulted in a thoughtfully-planned meal. I am grateful for this resource! 5.0 out of 5 starsGreat taste and keeping healthy! Great recipes for the Slow/Low Carb lifestyle. Easy to prepare and great tasting. I especially enjoyed the sweet potato casserole recipe. Lots of great tips for cooking the turkey and healthy sides. A very easy holiday cooking reference for anyone looking to minimize putting on any weight over the holiday period. I like it because it contains straight forward recipes that also teach you how small changes to traditional recipes can significantly improve your diet. 5.0 out of 5 starsDELICIOSO!! This is a great healthy guide for your entire Thanksgiving meal!! Jason always has the best recipes for living a healthier lifestyle!